Marilungo There is 1 product. The famous Calzaturificio Marilungo begins his story in 1979 thanks to Luigi Marilungo and his passion for the shoe, that embraces from the young age, when it moves the first steps as an apprentice footwear in a small workshop that works hand leathers of high quality. After years of experience in the footwear field, leather goods and accessories, passing from the disciple to master making the experience gained in the course of the years, an art. And in this way was born in Montegranaro, international cradle of the shoe, the small workshop. Today the company is a family run business as to the origins, boasts a product of craftsmanship entirely Made in Italy, which are always present elegance and design accompanied by comfort and continuous research of materials. One can truly say that the processing is changed very little! Evolve styles and i look but the quality remains the same. It focuses mainly on the shoes from classic man. Shoes elegant and refined that will never go out of fashion, remaining the must-have shoes to man with class. In the laboratory we discover with pleasure even a wide collection of footwear man for marriage. It is not only women having to be impeccable, in fact, the day of you! But also the man must be perfect, with style and elegance, and this it can be seen also and especially in the details. The tie or papillon twins, shoe from bridegroom are indispensable elements. 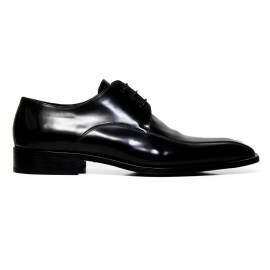 Normally are oxfords shoes black leather with laces paper thin and the tip slightly elongated: behold the model more classic shoes from the Bridegroom who likes to all and that can be worn with suits, Tuxedo combined with elegant papillon or ties. For the most important day of your life, you cannot renounce to style and quality. This collection is dedicated especially to the day of the marriage are the shoes from Bridegroom more refined and particular, for who loves an elegant look and out of the choir. The Calzaturificio Marilungo produces since 1949 shoes and accessories man exclusively "Made in Italy"
Wwhich represent the perfect blend between the craftsmanship and the stylistic tendency of italian time. Entrusted to the perfect mix of quality and bon ton. Sort on our website and choose between your favorite products: shipment expenses in Italy are free and the products will arrive at your home very quickly! Visit our store you will find amazing shoes, Marco Gozzi for women, amazing wingtip shoes, ankle boots waiting for you our store!